A real fast turn around from a big name. I was really excited to get this one in the mail, especially considering that it is from such a fleet receiver as Andre Reed. He signed all 3 cards and also included a business card with his email and address for his new line of BBQ sauce. 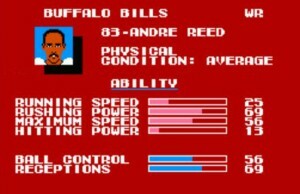 Andre Reed is needless to say, Kutztown Pa College’s most prestigious’ football player to ever play in the NFL. 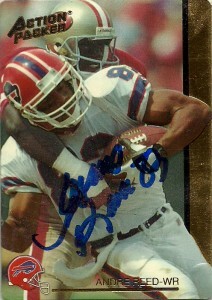 Drafted in the 4th round by the Buffalo Bills during the 1985 draft, he’d be the second most prolific receiver behind all-time great Jerry Rice. This draft in particular was incredibly stocked at receiver with names such as Jerry Rice, Eddie Brown, Al Toon, Reggie Langhorne, and Eric Martin, coming out of this draft. Andre is considered by all points and purposes one of the great finds of this draft. I’m not sure if he’s considered a steal, because nobody knew who he really was. He was a small town find by the Bills staff. Andre’s career started off anonymously enough with a respectable rookie season lodging 637 yards, 4 touchdowns, and a meaty 13.3 yard per catch. Notably his yard per catch would become almost a signature of Reed’s career. Over a 16 year career- he’d only have 3 seasons under 13 yards a reception. (A particularly salivating number in today’s pass happy NFL world.) Andre would build off of his rookie season as his receptions and yards would increase through 1988, culminating in his first of 7 Pro Bowl appearances that would last through 1994. In 1989 he’d have a career high 1312 yards, and post career highs in touchdowns with 10 in 1991. Reed in 1993 would have a whopping 16.4 yards a catch and over that period would play in 3 SuperBowls, finishing 3rd in the big game in yards and 2nd in receptions. An injury would sideline him in 1995, but he’d make a full recovery in 1996, logging his 4th 1000 yard season. 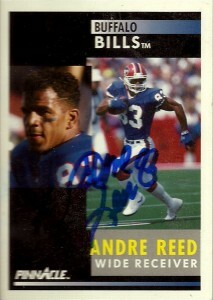 From 1997 through 2000, Reed’s career would slowly transition downwards, and in 2000 he signed with the Broncos. Unable to make a contribution to the team, he was released and played his final season with the Redskins before retiring. Reed’s career statistics, when looking at them year over year can be deceptive. While not a perennial 1,000 yard receiver, Andre was an integral part of the no huddle Bills offense in conjunction with Jim Kelly and Thurman Thomas. His overall career numbers in yardage at the time of retirement were top 10 and his receptions were third all time. Andre Reed has been eligible for the Pro Football HoF since 2006, but has missed the final ballot on every shot. With a large group of receivers who are becoming eligible for the HoF nomination, it is cloudy to say whether or not Andre will get his true due as a member of the yellow jacket club. 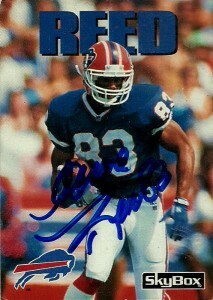 Andre was inducted in the meantime into the Buffalo Bills Wall of Fame in 2006. He’s also started his own line of BBQ sauce as previously mentioned, called “Over the Middle”. Part of the proceeds of the sale of his sauce go to impoverished children. I am told that it is quite good, and may give it a shot here in the near future. In addition Reed has done occasional commentary on NFL games for Fox and appeared in “Pros Versus Joes” on Spike TV. In 2011, he was honored with announcing the Buffalo Bills 2nd round pick.